Since the turn of the century, jihadist terrorist organizations have increasingly made use of social media outlets and the Internet to disseminate their propaganda. A recent case in point is the Islamic State, which uses the Internet to share its online magazines Dabiq and Rumiyah with its audience. These magazines provide an in-depth look into how the Islamic State interprets the world and how it frames this worldview for its audience. 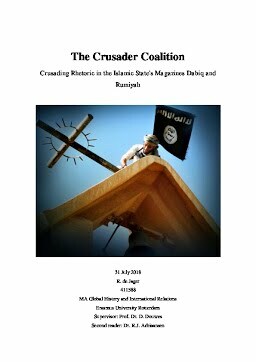 In constructing its worldview, the Islamic State uses historical analogies and other forms of rhetoric that link the current struggle to the era of the Crusades. This research has explored how the Islamic State uses such crusading rhetoric in framing its worldview in Dabiq and Rumiyah. The methodology used in this research rests on the three framing techniques of diagnostic, prognostic, and motivational framing, which were applied on several articles from Dabiq and Rumiyah in which the use of crusading rhetoric was prevalent. From these case-studies became evident that the use of crusading rhetoric is central in the construction of the diagnostic frame, which rests on a rigid dichotomy between 'camp of Islam' and the 'Crusader Coalition.' The prognostic frame and the motivational frame included much less crusading rhetoric. The main reason for this is the shift from interpretation to divine obligation and faith: in the prognostic and motivational frame Allah's promises for victory and the divine obligation of waging jihad were central. Crusading rhetoric was only used to make sense of the world in a way that would accommodate violent interpretations of Islam. This construction of a worldview rested on subjective interpretation rather than the divine prescriptions used in the prognostic and motivational frames. Keywords ISIS, Islamic State, framing, discourse, Salafism, jihadism, Dabiq, Rumiyah, crusade, crusading rhetoric, tawhid.